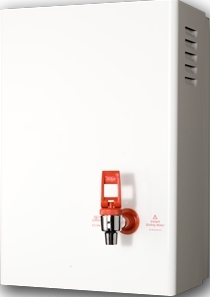 Zip Econoboil range of instant hot water, instant boiling water, hot water dispenser, hot water urn, instant water heater or boiling water units have been specifically developed to offer the consumer all the benefits that a boiling water unit has to offer while still affordable. Zip Econoboil range of quality products represents genuine value for money and all boiling hot water dispensers are manufactured under the strictest of quality australian standards. When you're looking for an instant boiling water heater for temporary accommodation such as site sheds or short term tenancies, choose the Zip Econoboil. They are available in three models and designed to deliver from 18 to 45 cups of boiling water at one time. Econoboil comes in capacities from 3 litre to 7.5 litre and is unfiltered.